GlogauAIR's Showcase is a space outside the building prepared for temporary installations. Artists have the opportunity to experiment and show off its projects throughout this showcase. 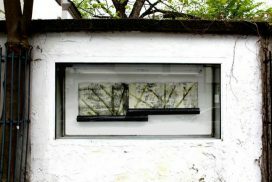 The Showcase is an ongoing project inside the window (85 cm x 185 cm x 35 cm) placed outside GlogauAIR’s building wall. 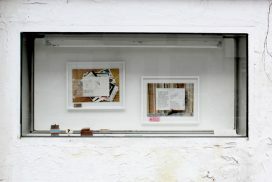 This project aims at exhibiting resident artists' work but in a very particular and special way; the showcase is an interface between the public and the private, between the space solely focused on art that GlogauAIR is and the immensity of the public sphere, where everything converges and mingles. 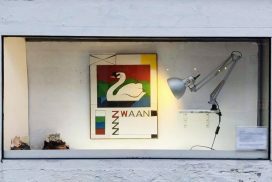 Here, art steps outside the walls of a gallery, a studio or the ones of a museum. 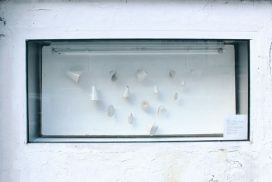 By being exhibited in this space, the showcased works intend to spark a dialogue, contributing to ideas that belong to everybody, as a society. 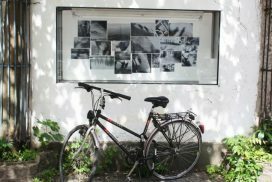 The showcase project is thus an attempt to create a fruitful conversation between art and the city of Berlin, an interaction between the vision of the artist and the casual passerby.